One of the things that I like about Ironman training is the complexity of it: the equipment, the logistics, the extended duration of the race, the nutrition, the combination of three individual sports. Doing an Ironman is like doing a puzzle over the course of 30 weeks, and then showing up on a single day to see how well you were able to fit the pieces together. What happened on race day seems so closely tied to the training that it’s hard for me to separate them in my mind. 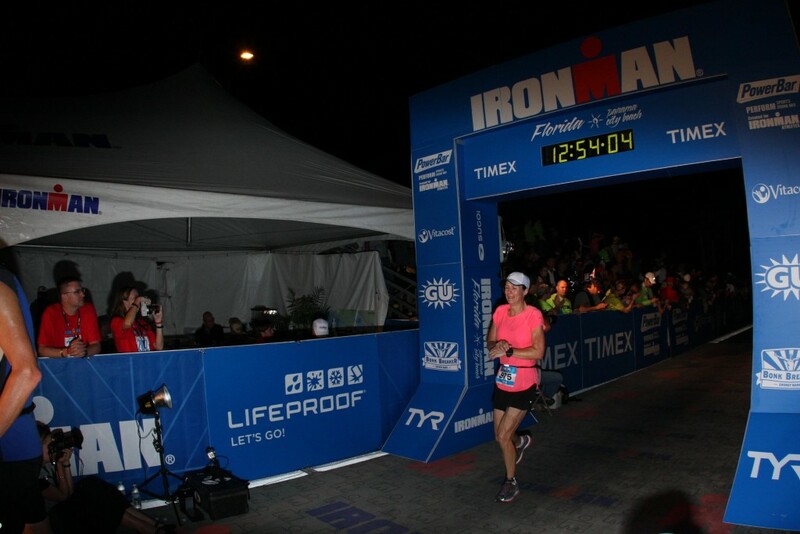 Instead of writing a chronological race report, I’m going to address different parts of the race, how I prepared for that part of the race, what I thought about it and what I would do differently or the same in preparing for Ironman Florida 2013. I’m going to break it up into different posts, but I won’t make you wait until the last one to know the final result. I am an Ironman! Here I am crossing the line with an official time of 12:54:05. I made the picture nice and big so that you could see that, yes, I am crying. I was smiling all day long but at the very moment they took my picture I was indeed crying because I was unbelievably happy. I’ll put some smiling pictures in later posts, but this one kind of cracks me up in an embarrassing sort of way. For the ten days leading up to the race, the forecast was for virtually no wind through the early morning hours. This would normally translate to a calm ocean swim. At the Athlete Meeting on Thursday night, there was no mention of jelly fish issues, whereas last year there was a problem with jelly fish. These two things put me at ease when I went to bed the night before the race. When we woke up and left the condo at 4:30 a.m. on race morning, it was too dark to see the ocean but the wind was blowing and we could hear the waves breaking on the beach. This caught me off guard and made me just a little nervous. I wasn’t worried about being able to complete the swim, I just wasn’t mentally prepared for a swim fighting the waves. I wish I had ignored the forecast and just assumed it would be a tough swim. Heading out the the beach, I could see the waves crashing and the swell of the ocean out past the breakers. The waves weren’t terrible, but I knew it would pay to be smart about how to navigate them. The course is two laps in a rectangle shape. After a swim straight out from the beach, there is a left turn into the sun, then a shorter stretch into the next left turn before heading back to the beach. There is a natural current to the left, so it’s important to stay to the right or else end up inside the buoy line and have to swim against the current and the crowds to round the first corner. When the canon boomed at 7:00, I lined up to the far right of the pack on the beach, probably half way back. I walked out into the breakers, taking my time and turning sideways as they hit me. When they were about chest high, I started swimming. Even past the breakers, there was a swell to the ocean. On the first stretch of the first lap, I swallowed a lot of salt water and had my head up quite a bit. Since I was far to the right, I didn’t have a lot of contact with other swimmers until I got close to the first buoy. I was taking it wide but a lot of others were also. Once I rounded the corner, it was very crowded and I was having more contact with other swimmers. I was biffed in the head, people tried to swim over me, people bumped up next to me. No one was aggressive or rough about it, it was just really crowded. Having my goggles knocked off would have been terrible, so I was conscious to stay back from other swimmers’ feet and tried to keep a arm in front of me while swimming. When I got some open water and really started swimming, I was catching up to the people in front of me. When I ran into a crowd, I just sat up and tried to find some open water around them. It’s amazing how much head down swimming I actually did with 2,700 other people in the water. I didn’t care about my time as much as getting out of the water in good shape for the rest of the race. When I exited after the first lap, I checked my watch and was happy with my progress. My official first lap time was 37:16. For the second lap, there is a diagonal swim against the current before hitting the first side of the rectangle. This makes the second lap longer than the first. Although I negotiated the waves a lot better by diving through them and there was less of a crowd for the first portion of the second lap, I was feeling a little queasy from all the salt water I swallowed on the first lap. The sea still had a lot of swell to it and when I had to put my head up to sight or navigate around others, I was catching a lot of water in the face and in my mouth. After that long in the water, the ocean is shockingly salty. With about 15 minutes left to swim, I started coughing and was feeling pretty nauseous. I decided that throwing up might not be such a bad idea. The salt water might make me dehydrated and upset my stomach making the rest of the race difficult. I sat up in the water and coughed and actually hoped it would all come up. After a minute, it was clear that it wasn’t so I put my head down and swam in, hoping that everything would stay down for the rest of the day. I completed the swim in 1:21:39. I had a little trouble getting my wet suit off because it got caught on my watch, but the peelers were patient and helped me get it over the watch and the rest of the wet suit off. Right after, I saw my daughter and my husband’s parents who were there cheering for us. I stopped to give my daughter a kiss and ran off through the showers and into the first transition. Looking back at my training, my training plan prepared me well for the swim. I had been swimming 3,500 yard workouts 3 times a week for the last 14 weeks or so of training which were taking me about 1:15 to complete. Prior to that I was swimming 3,000 yards. During and after the swim, I didn’t feel like my heart rate was elevated or that I was fatigued in any way. Once on the bike, I felt fresh and ready to ride. I use the Garmin 910xt which has GPS for swimming and, looking at my swim path on the map, I stayed on course pretty well. I mostly used the other swimmers as a guide since the swells make it difficult to see the buoys. That seemed to work just fine. Training for IMFL 2013, I wouldn’t do anything differently than I did this year. While I could have made it through the swim on less swim training, I think the non-impact, aerobic swim training paid off all day long. I’m actually glad that the swim this year was on the rough side because now I’m not as worried about what the swim might be like next year. I know if I stick with my training that I will be prepared and can make it through in the allotted time. There is still so much to write about! It’s been a week since the race and all of the details are still fresh and I’m still incredibly excited about the whole thing. Next, I’ll post about the bike portion of the race and have some less embarrassing pictures. That is just so exciting! That’s a great finish time! Big congrats to you! Beth, congrats on a great race! Can’t wait to read about the bike and run. Glad you stumbled upon my blog. 350 something days to go and I’ll br following along with you too! So proud of you, Beth! The picture of you crossing the finish is so awesome. Way to go!!! I can’t imagine the training regimen you have to put in to cover those kinds of distances in three events. An absolutely remarkable accomplishment!